Researchers have devised a way to measure the internal properties of stars, a method that offers more accurate assessments of their orbiting planets. that is approximately 92 light years away. More than a decade ago, scientists identified an exopanet in the star's orbit. HD 52265 became an ideal model for both measuring stars' properties and how such properties can shed light on planetary systems. Previously, scientists inferred stars' properties, such as radius, mass, and age, by considering observations of their brightness and color. Often these stars' properties were not known to sufficient accuracy to further characterize the nearby planets. In the PNAS study, the scientists adopted a new approach to characterize star-planet systems: asteroseismology, which identifies the internal properties of stars by measuring their surface oscillations. Some have compared this approach to seismologists' use of earthquake oscillations to examine the earth's interior. An artistic rendering of HD 52265 and its orbiting Jupiter-like planet. Image courtesy of MPI for Solar System Research/Mark A. Garlick. They were able to make several assessments of the star's traits, including its mass, radius, age, and—for the first time— internal rotation. They used the COROT space telescope, part of a space mission led by the French Space Agency (CNES) in conjunction with the European Space Agency (ESA), to detect tiny fluctuations in the intensity of starlight caused by starquakes. The researchers confirmed the validity of the seismic results by comparing them with independent measurements of related phenomena. These included the motion of dark spots on the star's surface and the star's spectroscopic rotational velocity. Unlike other methods, the technique of asteroseismology returns both the rotation period of the star and the inclination of the rotation axis to the line of sight. The scientists could then use these findings to make a more definitive determination of an orbiting exoplanet. While it had previously been identified as an exoplanet by other scientists, some raised doubts about this conclusion, positing that it could actually be a brown dwarf—an object too small to be a star and too large to be a planet. But, armed with the precise calculations yielded by asteroseismology, the researchers were able to enhance the certainty of the earlier conclusion. 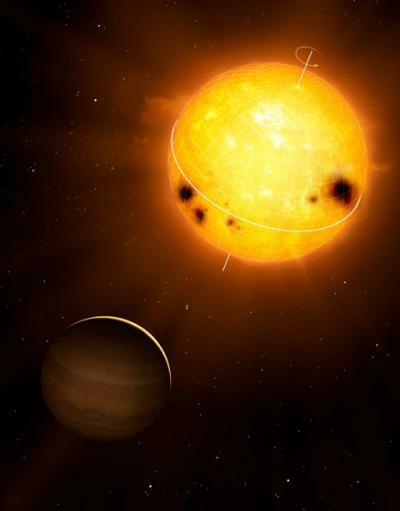 Specifically, given the inclination of the rotation axis of HD 52265 and the minimum mass of the nearby exoplanet, the researchers could infer the true mass of the latter—which was calculated to be roughly twice that of our planet Jupiter and therefore too small to be a brown dwarf.